First person, ugh. (Let it not be said that I only discriminate against female first person POV!) 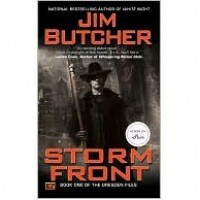 At least the MC of Harry Dresden is rather likable. "...I thought the base for a love potion was supposed to be champagne." "Champagne, tequila, what's the difference, so long as it'll lower her inhibitions?" Bob said. "Uh. I'm thinking it's going to get us a, um, sleazier result." -- "I coughed. 'Ah, yes. Ms. Randall--' / 'Miss,' she said, cutting in. 'Miss Randall. I'm not occupied. At the moment.' / 'Miss Randall,' I amended..." Let's discuss. Is not Ms. and Miss the same? What is the difference? I don't understand; is this a convention of the English language that I have somehow not ever encountered before neither in my life nor in any (of the numerous) text that I've ever read? "Science, the largest religion of the twentieth century, had become somewhat tarnished by images of exploding space shuttles, crack babies, and a generation of complacent Americans who had allowed the television to raise their children. People were looking for something - I think they just didn't know what. And even though they were once again starting to open their eyes to the world of magic and the arcane that had been with them all the while, they still thought I must be some kind of joke."